A builder stands in an open field and sees houses, a business park, playground, a hospital. Those passing by do not see the detailed blueprints, environmental reports or contracts made with building “specialties.” Eventually crawling, viciously toothed yellow monsters appear, digging, scraping, preparing the land. At the center of the entire project is the builder/architect. The project’s success depends on no one working independently from the blueprints and the builder/architect who knows how it will all come together. God sees the great potential for another open field, our life. And yet, often we build our lives without “reading” his blueprints. We may “doing” everything a “good” Christian should and yet we are not content with the outcome. The curb appeal of what we’ve built with our lives looks great but on closer inspection our construction is not up to code. Whether in our personal lives, the life of a community or family, when we build according to our own blueprints we will not be satisfied. Learning how to read God’s blueprints takes time, but the resulting beauty is breathtaking. 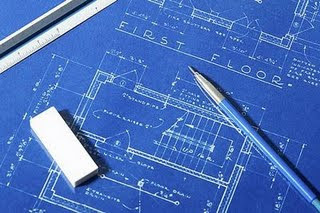 Thought for the day: What does it mean to learn how to “read” God’s blueprints for my life? Jesus, too often I live by my own plans and desires of how I want people to see me. Teach me to read your blueprints and become Your masterpiece.